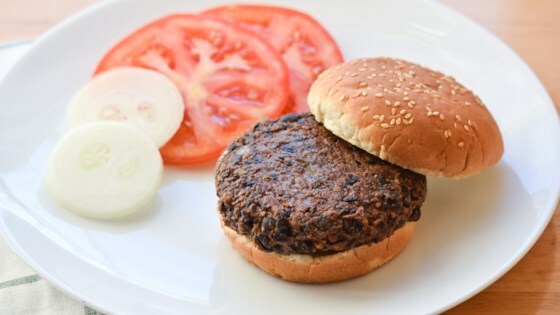 "Easy black bean burgers for everyone! You don't need to follow the recipe or amounts exactly. I never do. Serve with your favorite burger fixings and sweet potato fries." Mash black beans in a bowl; add onion, garlic, carrots, and green bell pepper. Mix. Whisk cornstarch, water, chile-garlic sauce, chili powder, cumin, seafood seasoning, salt, and black pepper together in a separate small bowl. Stir cornstarch mixture into black bean mixture. Mix whole-wheat bread into bean mixture. Stir flour, 1/4 cup at a time, into bean mixture until a sticky batter forms. Spoon 'burger-sized' mounds of batter onto the prepared baking sheet, about a 3/4-inch thickness per mound. Shape into burgers. One egg can be substituted for cornstarch, but it makes the recipe not vegan. Horribly dry, deffinatly needs some tweaking . This is the BEST BURGER recipe EVER! I made 4 of these burgers for myself (I am vegan) and made regular cheeseburgers for my kids- MY VEGAN BURGERS ARE GONE- I have 3 cheeseburgers left! nice and easy, i made it gluten free by substituting cooked brown rice for the whole wheat bread, with great results. I made this with leftover black beans from black beans and rice, added a few extra seasonings, the bread and some flour, and cooked as directed. They turned out amazing!